Around January, my friend, Abby, and I decided that we wanted to go hiking together one day. It wasn’t until in February that we finally decided to make it happen. 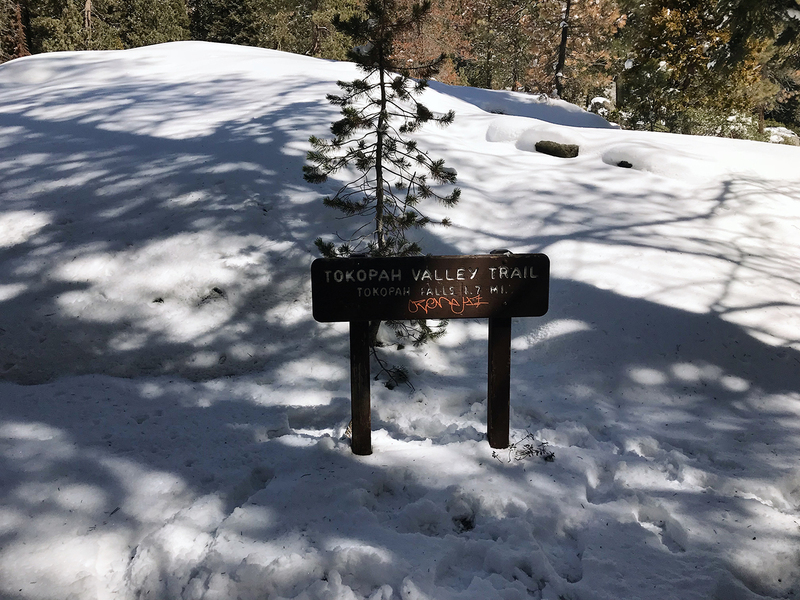 We picked out the Tokopah Valley Trail through the AllTrails website. It was rated an easy hike with a total of 3.7 miles and a total elevation of 567 feet. I was excited for this hike because I finally got to meet Abby’s husband, Jordan, and she finally got to meet Chris! We’ve shared several stories so it’s nice to finally put a voice and face to a name. Before we drove up to the mountains, we stopped by Exeter for breakfast at The Whistle Stop Cafe. Chris and I shared a plate of their corned beef and hash, and boy oh boy, it does not disappoint. 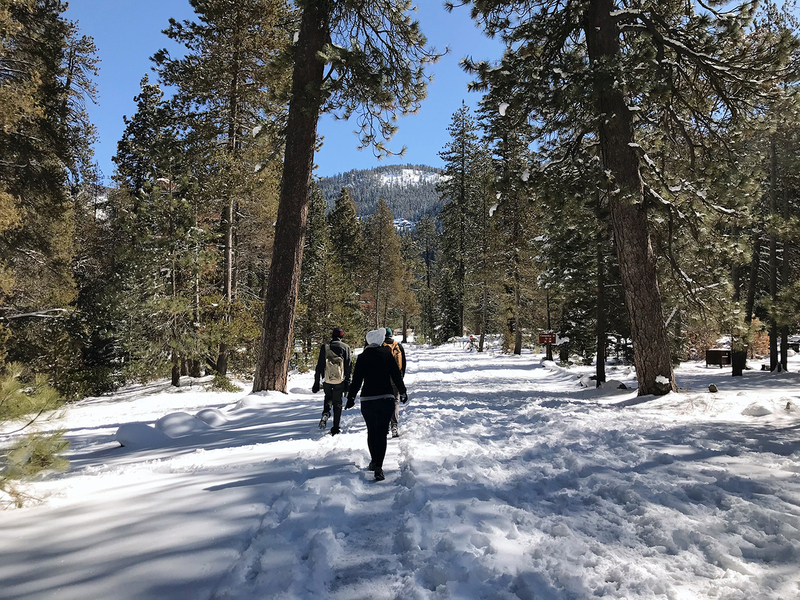 We drove separately but when we got inside the park, Abby & Jordan hopped into our car because they didn’t have any snow chains and apparently, there was heavy snowfall in the park recently. After driving up for a good 10 minutes, we finally saw the snow! We pulled over to the side of the road and put on the snow chains … after having some random lady assist us with them. 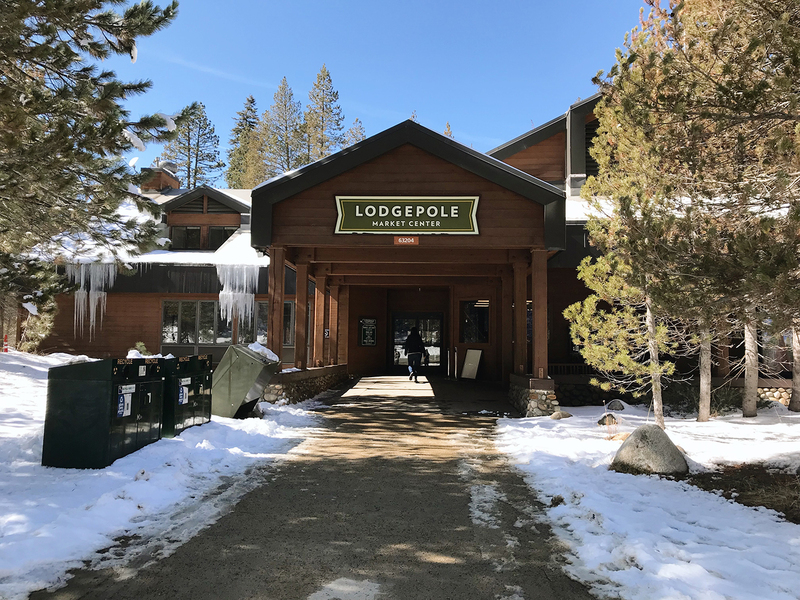 When we finally arrived at the Lodgepole Visitor Center, it was a winter wonderland. With the exception of the park rangers, there were only a few cars in the lot, most of which belonged to people dining in the marketplace. It was a bit of a walk to get to the trailhead itself but it was both fun and challenging. Challenging because hiking in inches of snow gets you easily tired than hiking on a dirt path. The hike was really fun! We were accompanied by a creek throughout the entire hike – or what was left of it anyway since most of it was frozen. Sure, we all slipped and nearly fell several times but what’s a good story without little things like that? Chris nearly fell on his face when we were making our way up. The views on this hike were incredible. We didn’t bump into too many people on the trail, so it almost felt like we had the entire trail to ourselves. 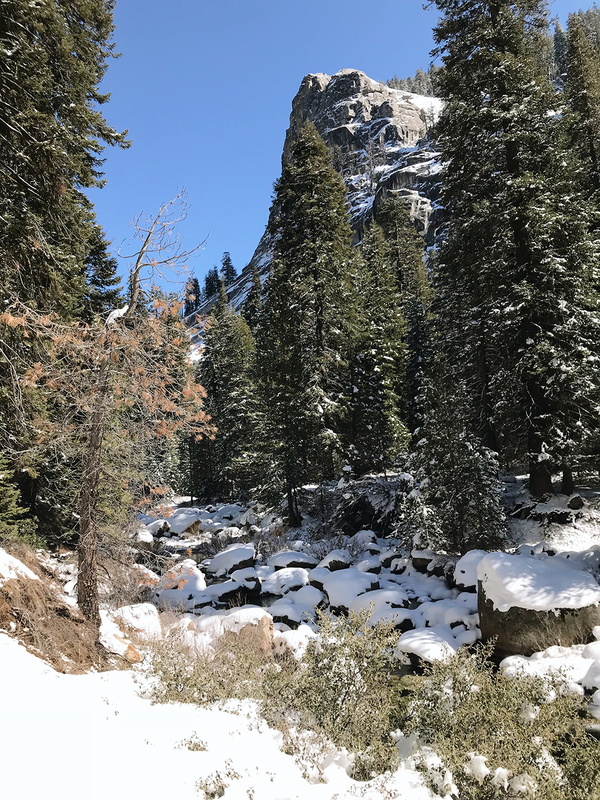 It was peaceful to the point that one could easily hear the drop of snow from the tips of the sequoia or the sound of the creek in the distant. 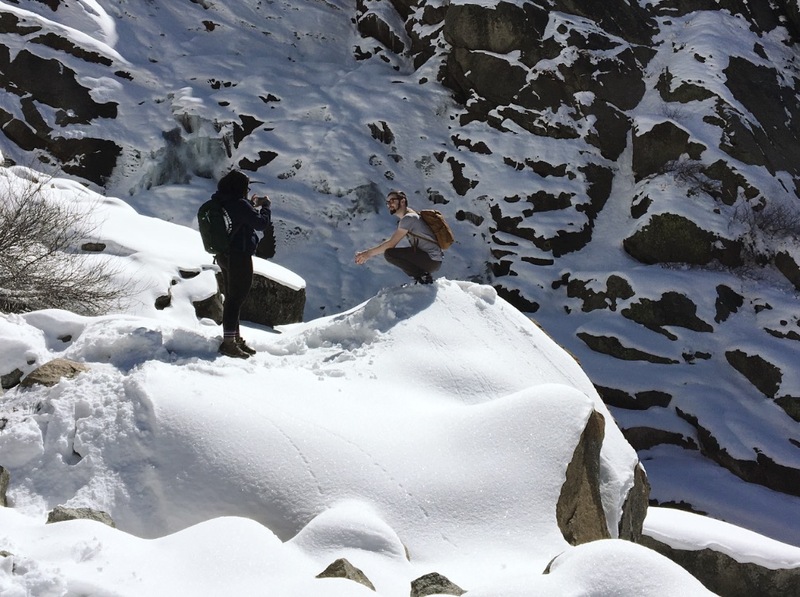 When we got the last stretch of the hike, we trekked over snow-covered rocks to see the waterfall and its beauty. The waterfall may have been replaced with frozen icicles hanging atop a rock, but it was still a beautiful sight to witness. Imagine how much more beautiful the place is in the spring or early summer when the waterfall defrosts? We spent a good 20 minutes by the fall and snacked on some beef jerky. The hike back to the parking lot was a lot easier and faster. We cleaned up, and drove back down to where Abby & Jordan parked. We did remove the snow chains earlier than we should’ve because we slightly skidded off the road – thankfully we were stopped by a tiny traffic sign that only left a scratch on my car. I’ve included a little video I made from this hike. It’s not much but it’s something – and don’t forget to subscribe to our Youtube channel! 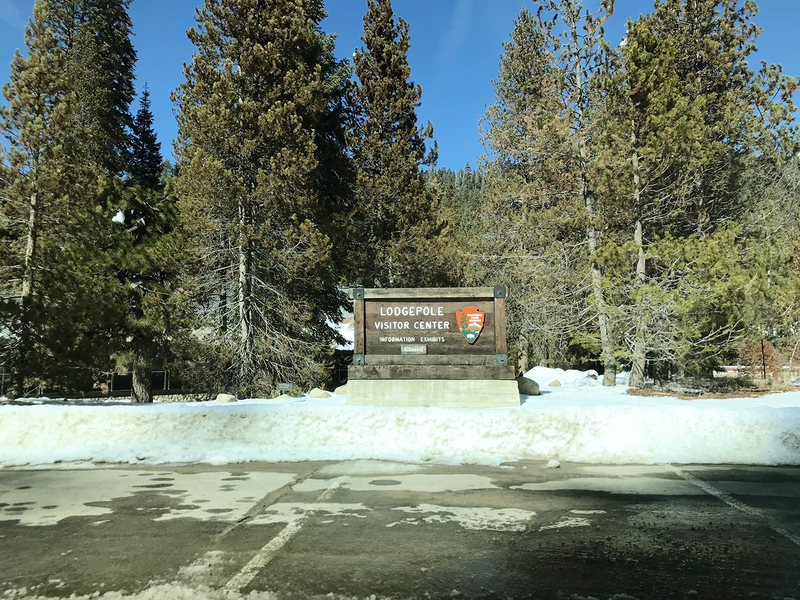 Trailhead and Parking: Parking is located within the Lodgepole Visitor Area. From there, follow signs for the camping sites and the trailhead begins after you cross the bridge. This really looks like winter wonderland! I’m totally impressed by those pics and I’m sure that trip was unforgettable. Look at you inspiring others to go hike with you! I love how you get to see snow pretty often! Yum, corned beef and hash sounds delish! 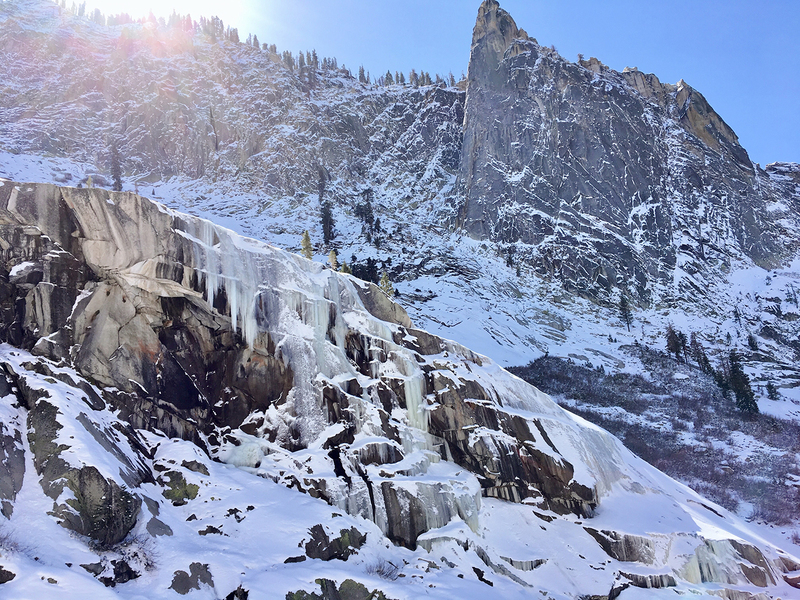 The surroundings at Tokopah Valley Trail looks AMAZING! I like that the area wasn’t too crowded! 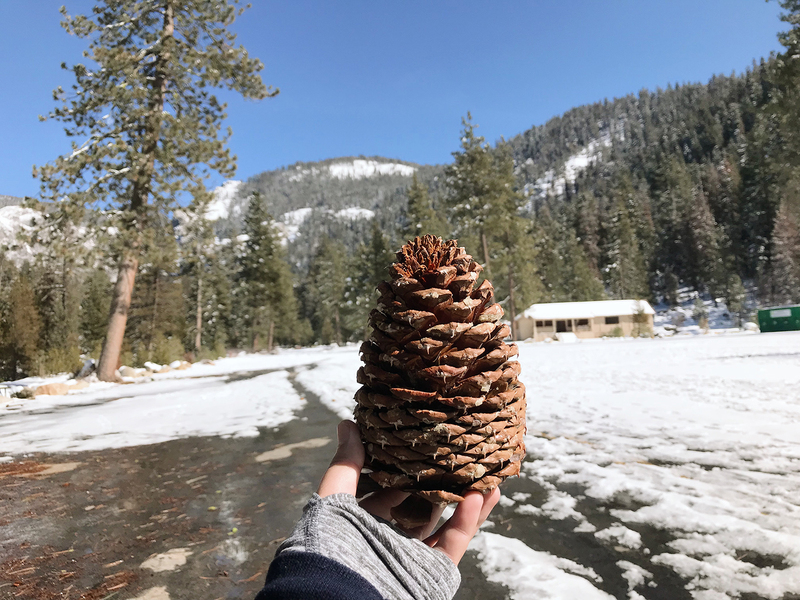 Did you know that pinecones are related to the Fibonacci sequence lolol? I always feel that the hike back is easier than the initial hike going to the destination. Why??? LOVE how you’re sharing the great outdoors of Cali!!! Looks like an amazing hike! Kudos to you for doing it in the snow. It looks so nice! I hope you a great time! What an amazing place to hike!! looks so fun! Wow the place looks amazing! It’s cool that the hike was not a very difficult one. Hope you guys enjoyed your time. That is a HUGE pinecone! this trail looks absolutely beautiful in the snow! 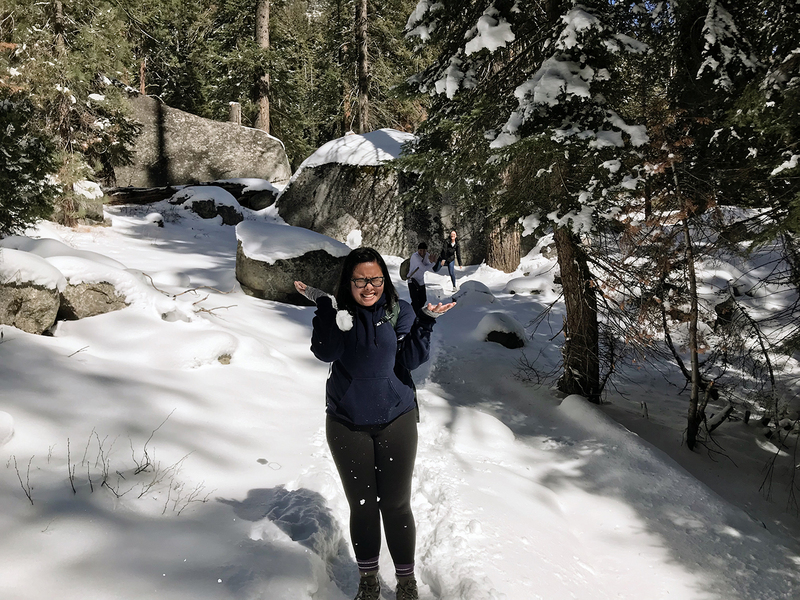 SUCH a fun idea to hike in the snow! 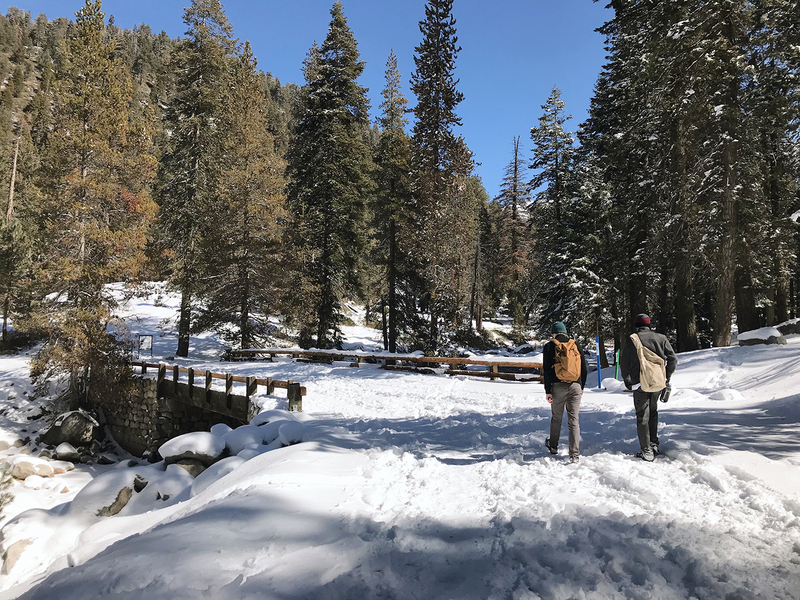 I love hiking for the solitude and peacefulness and I think experiencing that with the snow would make it absolutely magical. And that pic of the boys hiking through the trees is so cool! Love that you guys always make it outside! That looks so nice! That’s a good local trip idea! This looks like an amazing trip. Looks like an amazing hike!! What a fun experience! what a gorgeous scenery for a hike!! So stunning! So much snow! Love reading your blog to see all the different hiking spots in your area. Wow, this trail looks amazing! 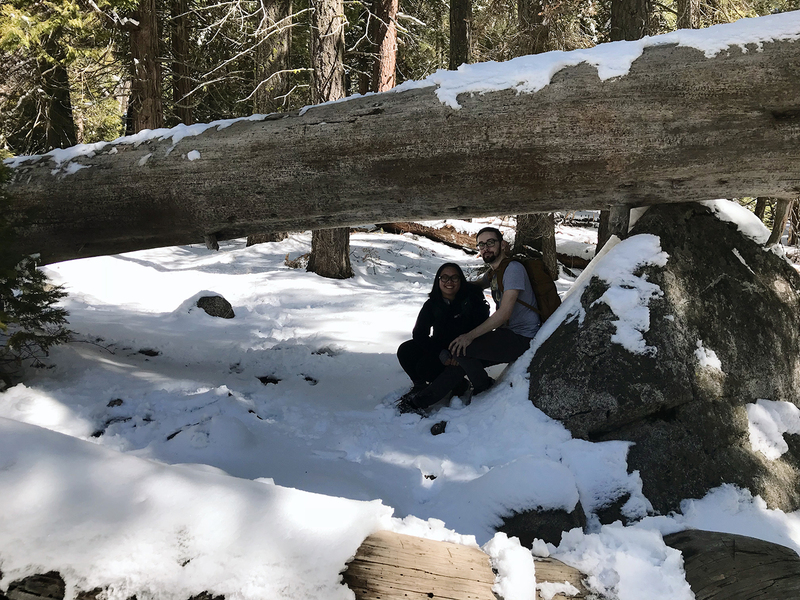 I love hiking in snow…it always seems more peaceful! Great photos…you captured the views so beautifully! This is absolutely breathtaking! I’m dying over the scenery! You guys have such a pretty area to explore! What a great travel adventure. Looks like y’all had a great time. Look at that winter wonderland! Great shots! I would love to try hiking in the snow. These views are absolutely beautiful too! The frozen falls looks magnificent! Nice to see your adventures especially snowy ones like this since we don’t get snow in Sydney. Wishing you a great Easter Eena! I love how you went on a cute couple trail THATS JUST GOALLLSSS!!! I love how often you go hiking! I wish I did that. I guess I’ll read the books and you do the hiking haha! We’ll live vicariously through each other 😉 Love the video! Impressive photos! So nice when there’s snow and sunshine at the same time. 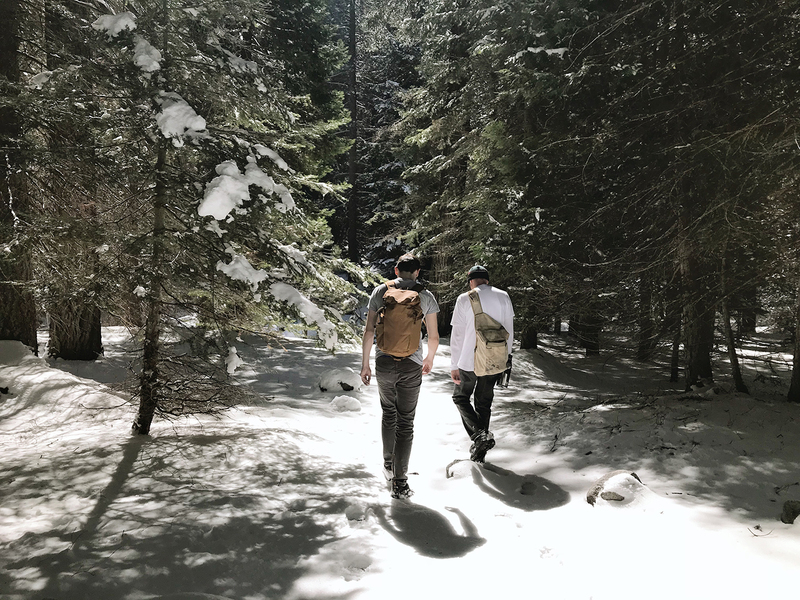 I find hikes difficult at the best of times – so I can’t imagine doing one in the snow! What a lovely day to spend with friends though and you got some gorgeous photos! This walk looks beautfiul and I love the fun style of all of your photos! Looks like a wonderful place to be in the snow!